Producers continue to rebuff talk that the new CBS political drama, “Madam Secretary,” is based on Hillary Clinton. They will, however, admit that the former secretary of state, senator and first lady had undisputed influence on the show’s storyline. 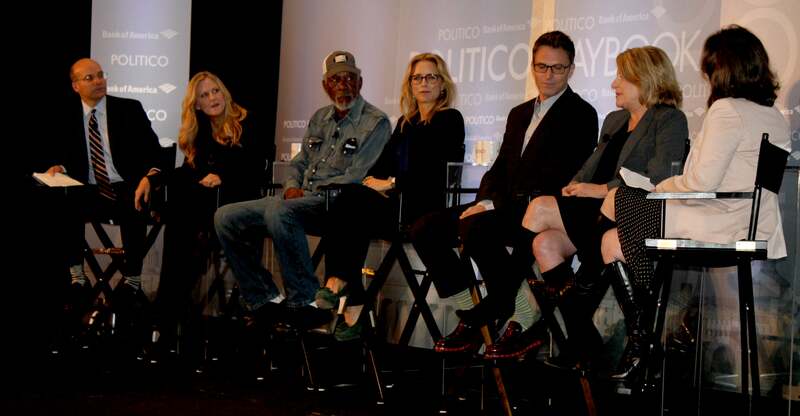 Appearing today at an event in Washington, D.C., Lori McCreary, executive producer of “Madam Secretary,” reiterated that the idea for the show starring Téa Leoni originated with news clips of Clinton testifying before a congressional panel on the Sept. 11, 2012, terrorist attacks on Americans in Benghazi, Libya. McCreary recalled seeing Clinton pound her fists on the table at the hearing — the one on Jan. 23, 2013 where she uttered the now notorious line, “What difference does it make?” — and wondering what it was like to be a female secretary of state. “Madam Secretary,” which premieres Sunday, centers on newly appointed Secretary of State Elizabeth McCord, played by Leoni, and the events that shape her professional and personal lives. When crafting her character, Leoni said at the event at the the Hyatt Regency on Capitol Hill sponsored by Politico, she drew inspiration from the women who raised her. And also from another former State Department head who recently came out with a book — Henry Kissinger. Congressional investigators continue to work to learn what happened before, during and after the events in Benghazi that left Ambassador Chris Stevens and three other Americans dead. On Wednesday, the House Select Committee on Benghazi held its first public hearing examining the attacks.